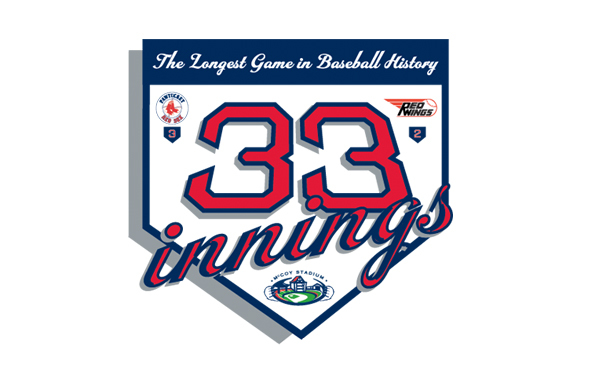 The longest game in the history of professional baseball took place in 1981 between the Pawtucket Red Sox and the Rochester Red Wings, two teams from the Triple-A International League. The game lasted 33 innings and went on for a total of 8 hours and 25 minutes. Played at McCoy Stadium in Pawtucket, Rhode Island, the first 32 innings of the contest were played April 18th and 19th. The final inning of the game was played on June 23, 1981. Pawtucket won the game, 3–2. A pair of future Hall of Famers took part in this marathon competition. Cal Ripken, Jr. batted 2–for–13 while playing third base for Rochester. (The following year, Ripken would be named Rookie of the Year in the American League.) Meanwhile, Wade Boggs played third base for Pawtucket, going 4–for–12 with a double and an RBI. You can find some interesting numbers from the game here, and the official box score can be found here. That scorecard has got to be floating around somewhere. I can’t imagine being the scorekeeper, trying to stay focused for that long, trying to keep all those inning straight. I wonder how many sheets of paper they went through? I see that Ojeda and Hurst were the last 2 pitchers for Pawtucket and the fifth pitcher was Win Remmerswaal from the Netherlands. Full name Wilhelmus. What an awesome name for a pitcher!! He pitched two years for the Red Sox, even has a couple of baseball cards. Here’s the link to the game, boxscore and what not. This is great! Thanks, Steve. I wonder if he ever faced Rikkert Faneyte at any point?